Looking to celebrate your weekend with a world class show that doesn’t break the bank? 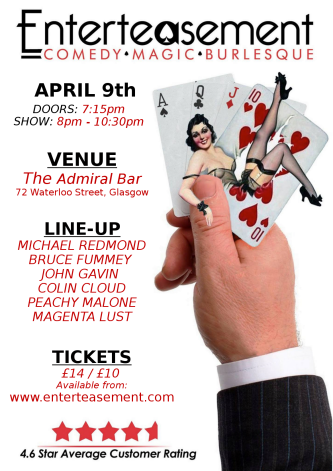 Then try Enterteasement Comedy, Magic & Burlesque show. Our April 9th line-up boasts award winners, As ‘Seen On TV’ stars and International acts. Our shows have a 4.7 star average customer review and sell out fast! So get your tickets now and have a weekend to remember. Bruce is a top rated comedian / after dinner speaker who has just returned from a comedy tour of Australia. Bruce is a storyteller who focuses on his life experiences & observations of Scottish Culture from a West African viewpoint. John started comedy in 2009 and not only made it to the final of ‘So You Think You’re Funny’ he also won the prestigious contest ‘Scottish Comedian Of The Year’. This man will blow your mind!! In the last 12 months Colin has toured the world, joined The Illusionist “Live In London” hit show and regular reads Holly Willoughby mind on ITVs This Morning. Our South African pint sized princess will be dazzling you with her unique style of burlesque mixed with belly dancing and shadow dancing. Magenta is an International alternative burlesque performer. Her playful combination of burlesque and grotesque saw her climb the ranks of Scottish burlesque and recently headlined The Berlin Burlesque Festival.